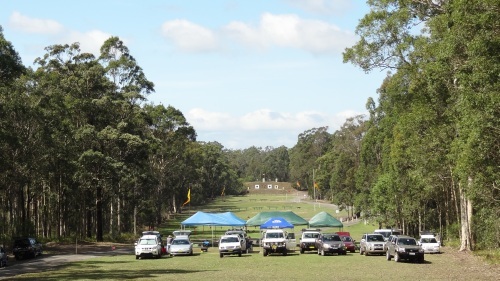 Nowra Rifle Club Inc is one of the oldest rifle clubs in the country. It was formed in 1888, as part of the Volunteer Rifle Corps of the Defence Forces of the Colony of N.S.W. prior to Federation. After Federation, the Club was affiliated into the N.S.W. Rifle Association and its members empowered by the Defence Act. The rifle range was first located almost in the middle of what is now Nowra. In 1958 it relocated to its present site just south of Nowra. From inception until 1990 Nowra Rifle Club Inc was a ‘pure’ Fullbore Club. In 1990 we decided to open the club to all forms of shooting sports. Black powder shooting was introduced in 1990 followed by Small Bore in 1991. In 1993, the Club resolved to introduce Pistol Shooting and by April 1994 the Nowra Riflemans Pistol Club Inc. was established. We now have 6 ranges operational, a new clubhouse incorporating an indoor air pistol and air rifle range, composting toilet block and an all weather road. The club is professionally run by an executive committee of 23. A works coordinator and sub committee attend to new and on going maintenance around the range. Other sub committees are formed when the need arises to undertake a particular task. 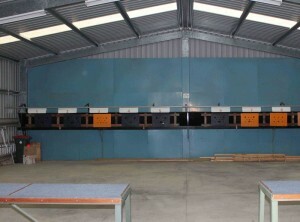 A section of the Indoor range. Great pride is taken in our grounds and environment. Wallaby, Kangaroo and duck are just 3 of the many species of animals and birds that choose to live and breed in the surrounds of the range. As one can see from our header image, the wild life do not seem too mind the occasional noise of the bullets, in fact wallaby often come onto the range in the afternoon to graze when a shoot is still in progress. No native animal has been accidentally or otherwise shot or injured at Nowra Rifle Range. No town water or electricity is connected to the range; we use tank water and have a composting toilet block, bucket showers are available to members and visitors camping on the range during a prize shoot. With regard to rubbish, no garbage bins are provided, our policy is “You bring it you take it home” (this includes cigarette butts) this way we keep a tidy litter free range. Used bullet cases are collected and either recycled or sold as scrap metal. View of Nowra Rifle Range from 600m. Nowra Rifle Club Inc has provided over 100 years of service to the Shoalhaven. As a point of interest, in 1876 Australia sent its first International team of sportsman overseas. A team of marksman! Shooting, was the first sport to officially represent Australia.